Dolphins Day Nursery welcomes all Babies and Pre-School Children into a warm, safe and caring atmosphere. We are open from 7.30am to 6pm Monday to Friday. We are open 52 weeks of the year. We have a number of different sessions available and we offer free entitlement to eligible children. Below are the latest reviews for Dolphins. Please note that reviews represent the subjective opinions of other Childcare.co.uk users and not of Childcare.co.uk. Parents must carry out their own checks and references on childcare providers to ensure that they are completely happy before enaging in the use of their services. Highly recommend! My daughter love going to her nursery. Seeing my daughter, how she develop her skills, social behaviour and confident. She learned so many things (counting, identify colours, writing & creativity in art). They also teach children the diversity( different languages & culture of other countries). Which I'm so impressed that my daughter can sing in different language. Nicole and her staffs are very helpful, supportive and friendly. Both of my children have gone to Dolphins from 6months old and I have been very happy with how they are looked after. 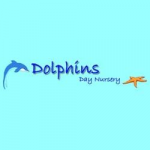 The staff at Dolphins are experienced and have been at the nursery as long as my children have so I am confident with how they are looked after. They are really friendly and welcoming and ensure they get to know all of the children. My daughter has just started school and left confident and ready to start school, having done counting, writing as well as having lots of fun. My is nearly two and is learning so quickly in his surroundings. The nursery have taken them on some great trips out, and invite parents to join in when possible. The price is cheaper than several other local nurseries but I found this nursery better than the others I visited, more than anything because it is a warm, friendly environment. Thank you for such a positve review of the nursery and taking the time to let us know. I will ensure your review is passed on to the rest of the team, it is very much appreciated.